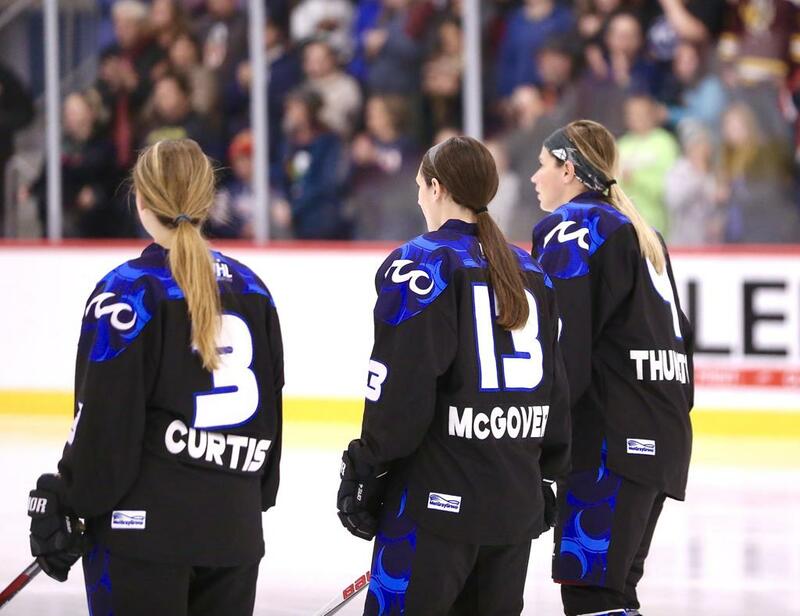 In their final regular-season home game at sold-out TRIA Rink, the Minnesota Whitecaps took a 9-0 win over the Connecticut Whale on Sunday afternoon. The Whitecaps sold out all eight of their home games in their inaugural season and currently sit in first place with a 10-4 record, increasing their likelihood of hosting a home playoff game. Jonna Curtis led the Whitecaps with four points on a goal and three assists to move back into a tie for the league lead with 17 points on the season. Kendall Coyne Schofield had a two goals and an assist, while Katie McGovern picked up a pair of goals, Allie Thunstrom had a tally and a helper, and Emma Stauber had two assists. Kalli Funk netted her first career goal, and goaltender Julie Friend picked up the shutout in her first career start. Amanda Boulier broke the scoreless tie midway through the second, with her trademark slapshot from the point. Funk then doubled the lead four minutes later, throwing a puck on net from the along the goal line that banked in to give the Whitecaps a 2-0 advantage at the second intermission. Connecticut starting goaltender Meeri Räisänen left the game late in the second period after a collision. Minnesota then broke the scoring open in the third. Curtis scored just 1:57 into the frame, walking in on net and putting away a high shot. McGovern and Kate Schipper then scored 50 seconds apart, with Curtis and Stauber picking up the assists on both tallies. The Whale headed to the power play 5:25 into the period, but Coyne Schofield capitalized shorthanded, cashing in on a breakaway at 6:28. McGovern then netted her second of the day, tapping the puck into the open right side of the net on a rebound from Curtis on the power play. Coyne Schofield added her second of the day at the 12:05 mark for the 8-0 lead. Thunstrom capped off the 9-0 victory with a goal with 47 seconds remaining. The Whale return to action on February 2, heading to Boston for a 7:30 pm matchup with the Pride at Warrior Ice Arena. The Whitecaps have a lengthy hiatus from NWHL action before travelling to Boston themselves on March 2. Tickets are on sale at NWHL.zone/tickets.